Baby’s skin is very soft and sensitive and it needs time to adapt to the outside world and develop protective elements. With baby skincare in general, use the rule of less is more. Some experts recommend using only water during the first month of life to give your baby time to build up their skin's protective barrier against allergens along with the self-moisturizing factors that will help to keep their skin smooth and soft. If allergies run in your family, this is especially recommended. Carefully select a mild soap. Inevitably, some will get in baby’s eyes and mouth and if it’s not mild, you baby will holler. Consider using an organic or natural baby product. Make sure you choose one that is alcohol free as this tends to dry out the skin. Depending on your baby’s skin sensitivity and dryness, you may want to avoid any with perfume or fragrance. A baby wash can be used for her hair as well as her body instead of a separate shampoo until your little one has lots of hair. If baby’s skin does get dry, use a natural baby cream or natural massage to moisturize your baby's skin. A general rule is the thicker the better. If your baby's skin is still dry even with daily moisturizing, try switching from a lotion to a thicker cream or ointment. You might also want to consider moisturizing twice a day. 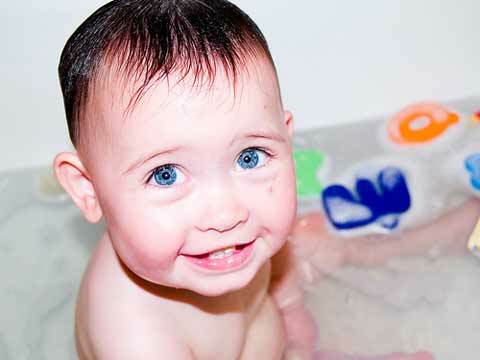 Another tip for decreasing dry skin is to shorten bath time.